“Hold at all costs!“ was General Norman Daniel “Dutch“ COTA’s order to the three regiments of the 28th US Infantry Division early in the morning of December 16, 1944, the beginning of the Battle of the Bulge. This order was strictly observed by the battalion and company commanders at the 25-mile-wide front of “Skyline Drive”, the road running south - north from Ettelbruck up to Weiswampach, Luxembourg. The totally outnumbered and outgunned US rifle companies with their attached units resisted, fought and inflicted great casualties on the enemy. They slowed down the German advance in disrupting the enemy’s timetable. This gave the US time to move major reinforcements forward to Bastogne. The “Keystone Division” unquestionably helped to save Bastogne. Alice M Flynn’s book, “The Heroes of Hosingen: Their Untold Story”, gives an expressive and detailed picture of how the US garrison in Hosingen bought time to the US generals by their stubborn resistance following the order to fight to the utmost. The author did a conscientious research based on books, articles, reports, interviews, letters, web sites and online articles. She visited the combat area, interviewed US veterans as well as local Luxembourgers. She was able to localize the exact positions of the fighting platoons and sections. She composed a precise, well documented text that visualizes the merciless fights that occurred in and around the town of Hosingen. Without any embellishment, she immerses the reader into the GI’s mind and lets him feel the mortal fear, anger, hatred, despair, resignation, frustration and sufferings. Due to a fluent and accurate language, completed by the soldiers’ authentic and vivid comments, the reader becomes in mind part of the garrison. He lives through the threatening stress the soldiers were exposed to. He is under the spell of the realistic atmosphere of war, with all its horrors. He sees in his mind the badly injured soldiers, the crashed and mutilated corpses. He can imagine the struggle for life and survival that spurs on the combatants. He feels the nervous strain, the gloomy oppression and dejection of prisoners of war. The exact geographical locations, the author’s professional military and tactical knowledge make the book a precious documentation about the defense of the town of Hosingen as well as the gallant soldiers involved in it. It is a valuable witness of the US soldiers’ commitment, engagement, sense of responsibility and toughness. It is a book highly recommended to everybody interested in WW II History. Alice Flynn has done a great job of research in putting this book together. I wish everyone would read it and try to picture themselves in that situation. Those soldiers accomplished an almost unbelievable job of holding up the German advance for three days giving time to get the 101st into Bastogne. Well done! The United States produced a number of hard-fighting units who won renown in World War II, and one of the hardest fighting and most famous was the 28th Infantry Division. Originally composed primarily of Pennsylvania National Guard units, and sporting Pennsylvania's keystone emblem in red on their shoulders, the men of the 28th Division battled their way across France in that amazing summer of 1944, earning themselves a place in the victory parade that marched under the Arc de Triomphe after the liberation of Paris. After a brief rest, the 28th was moved up to the German border and faced the fearsome defenses that the Germans called the Westwall, but which the GIs knew as the Siegfried Line. Such was the 28th's reputation as hard fighters--both German foes and American comrades had begun to refer to their shoulder patch as the "bloody bucket"--that they were sent to bail out other flailing American units that had suffered high casualties for little gain in an area of wooded hills known as the Hürtgen Forest. Sadly, the valor of the 28th was no match for the terrain, the German fortifications, and the lack of planning and support from higher echelons in the American Army, and the 28th made just as little headway as its predecessor, while suffering horrible casualties. At length, in November 1944, what remained of the 28th was withdrawn from the Hürtgen Forest and it swapped places with the 8th Division, taking up defensive positions in a quiest section of the line some miles to the south, in the Ardennes region of Belgium and Luxembourg; a ridgeline known to the GIs as "Skyline Drive," its name inspired by the road in Virginia through the Blue Ridge Mountains. This was a quiet sector, a perfect location to recuperate from the rigors of Hürtgen, to receive green replacement troops from stateside and introduce them to combat and the practices of life at the front, without exposing them to undue hazard. The US Army planned no offensive operations in this area until at least the spring of 1945; and all reports coming from the intelligence branch indicated that the Germans across the Our River valley were quiescent as well. But the intel reports were wrong, and in the early morning of 16 December 1944, the Germans unleashed their Ardennes counteroffensive--Hitler's last desperate gamble to unhinge the Western alliance and make a separate peace in the west so that he could devote his attention to fighting the Russians in the east. Of course, the men of the 28th Division, in their village bivouacs and hillside observation posts, didn't know those details. All they knew was that three German corps were bearing down on their single division, and they were fighting for their lives. One of the villages held by the 28th was Hosingen, a hamlet perched on the ridgetop almost astride one of the few roads that led from the Our Valley in the east, over the ridge and down the other side to the important road junctions of Wiltz and Bastogne. For their offensive to succeed, the Germans had to have Bastogne; and to get Bastogne, they had to have the road that Hosingen guarded. The village was defended only by K Company of the 28th Division's 3rd Battalion, 110th Infantry Regiment, and a company of engineers from the 103rd Engineer Combat Battalion, plus some scattered machine guns and mortars of the 3rd Battalion's heavy weapons company and a couple of small (and obsolete) antitank guns from the regimental AT company. This small band--roughly 300 men in total, many of them green replacements, and short of automatic weapons, mortars, ammunition, and radios, had to defend a front of about two miles against the onslaught of around 5,000 Germans from the 77th Grenadier Regiment, 26th Volksgrenadier Division, with two elite panzer divisions right behind them, waiting their turn to cross the Our River and sweep over the Skyline Drive to Bastogne. 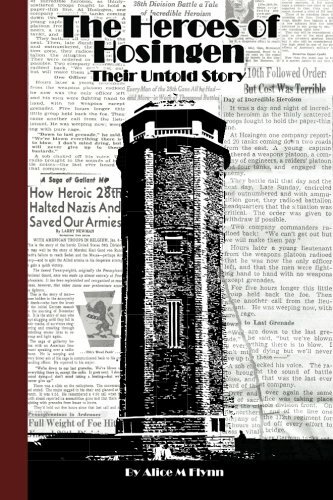 In "Heroes of Hosingen," Alice Flynn--whose father was 1st Lt Thomas Flynn, executive officer of K Company during the defense of Hosingen--has combined archival research with personal anecdotes and other research to assemble a detailed and compelling portrait of the valiant but doomed American defense of this small Ardennes village. She introduces us to many of the principal characters of the main drama by recounting their horror stories from the Hürtgen Forest, then brings us forward with them to December of 1944 and the epic, awesome, and awful ordeal they endured at Hosingen, trying with all their might and courage to block the road to Bastogne. Flynn has also managed to accumulate an impressive selection of photographs of the battle area, so that the reader can see Hosingen as the men who fought to defend it did. She manages to wrap a wealth of information that would delight an historian in a narrative worthy of a novelist, and the result is a true story, well told, that is hard to put down. So many of the heroic stories of the Battle of the Bulge tend to get lost in the glare of epics like the defense of Bastogne or the fight to trap Kampfgrupper Peiper. The defense of Hosingen--conducted in part, as historian Bob Phillipps has called it, "To Save Bastogne"—is one of those tales that is now finally told as it should be. This book captivates the mind and emotion of the reader as if they were present during the valiant efforts to push through Hürtgen Forest. The portrayal of the amazing standoff in Hosingen, slowing Hitler's armies, gives the reader a feeling of being present. The portrayal of the prisoners' terrible experiences at the hands of the Germans is gripping. The research is amazing in depth and detail. This author is a hero! By mark weiss on February 8, 2016: A very interesting account of a story that needs to be told. By John Dunlavey on January 27, 2016: Amazing story, I read about the highlights of the fighting in a magazine a few years ago. As a historian I wanted to learn more. Flynn does an amazing job in the detail. The maps and photos are really unique and helpful. It is great to read about the individual stories; to include what happened to them after veing captured. Also..check out her webpage! By mark erickson on January 17, 2016: Alice Flynn has done a great job of research in putting this book together. I wish everyone would read it and try to picture themselves in that situation. Those soldiers accomplished an almost unbelievable job of holding up the German advance for three days giving time to get the 101st into Bastogne. Well done! Well written, lots of detail! By P. Smith on December 18, 2015: I really enjoyed this book about the first hours and days of the WW2 Battle of the Bulge. The author gave lots of detail and the personal stories were interesting to read. I would buy it again.